The Regency era (1795-1825) predates the Victorian Era. The styles changed dramatically between the two eras. In the predominantly Protestant and Catholic countries of Europe, ladies' clothing was neither corseted nor tightly-fitted from the waist up. They were not hoop-skirted, crinolined, heavily full-skirted, or bustled below either. One of the most popular books from the Regency era is Pride and Prejudice, which provides an image of the fashions and attitudes of the period. Likewise, Gone with the Wind gives us a glimpse into the fashions of the antebellum South. Regency gowns are characterized by a very high-waisted bodice, from which a lightweight fabric is gathered to fall to floor-length. The neckline of a Regency style dress was often cut square and very low, and small puffed sleeves often barely covered the shoulder. For modesty, women often wore a pretty chemisette similar to a dickey to fill in the exposed chest area for daywear. The style of Regency gowns was based on flowing Grecian robes. The soft muslin dresses of 1800 clung to the body highlighting the natural body outline, so stays were unpopular unless the figure demanded them. These Empire-waisted Regency dresses at the turn of the century were often little more than sheer nightgowns. The practical solution to the discomfort of lighter clothing was to simply adopt the warm undergarment called pantaloons and already worn by men. To keep the effect of having nothing on under the Regency dress, these pantaloons were made of flesh-toned fabric. The fabric for Empire line Regency dresses was usually fine white lawn, muslin, or batiste. Although muslins were less costly than silks, good white work embroidered lawn fabrics still cost money. Muslin also laundered better than silks, but the white muslins still needed a great deal of attention to keep them looking pristine clean. Regular wearing of white gowns was a sign of social status, as white soiled easily. White Regency gowns generally were kept for evening, and in the day, pastel or colored robes were thought more suitable. In winter, heavier velvets, cottons, linens, fine wools, and silks were used and sometimes extra warmth came from flannel petticoats or full under slip dresses. 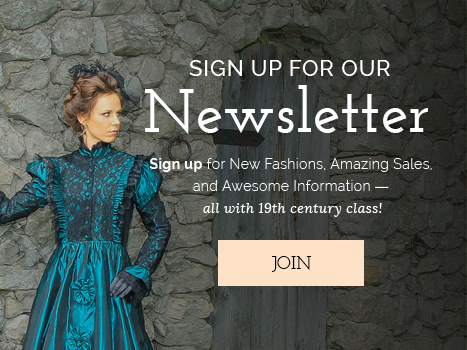 We hope you enjoy the Regency gowns we have gathered for you in this section. They are a romantic must-have for a lovely summer afternoon! 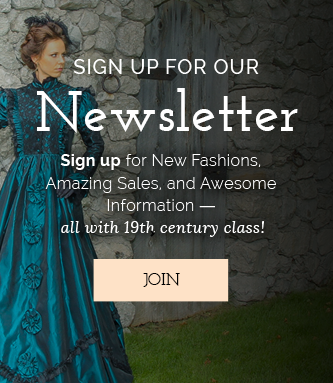 Browse our catalog below to find your perfect Regency dress!